The luxury conglomerate reported only 4 percent growth in its businesses last year. Will Marc Jacobs' IPO help them out this time around? 2013 was a slow year for LVMH, the parent company of Louis Vuitton, Sephora and Marc Jacobs. In its annual report, the luxury conglomerate reported that revenue is still growing, albeit much less quickly than it has in years past: LVMH posted revenue of €29.1 billion ($39.38 billion), a 4 percent increase over 2012 -- far less thanthe 19 percent (€28.1 billion) growth it saw between 2011 and 2012. Revenue from watches and jewelry sank 2 percent from 2012, having grown 46 percent a year ago. Fashion and leather goods also sank slightly, with a revenue decrease of 0.4 percent. Spirits/wines and perfume/cosmetics grew 1 and 3 percent, respectively. Sephora and LVMH&apos;s other selective retailing brands — DFS, Le Bon Marché, la Samaritaine and Royal Van Lent — showed the most growth of LVMH&apos;s businesses, up 13 percent from the year prior. According to the company report, the addition of Marc Jacobs&apos; new cosmetics line as exclusive to Sephora helped the beauty chain gain an edge over its competitors. 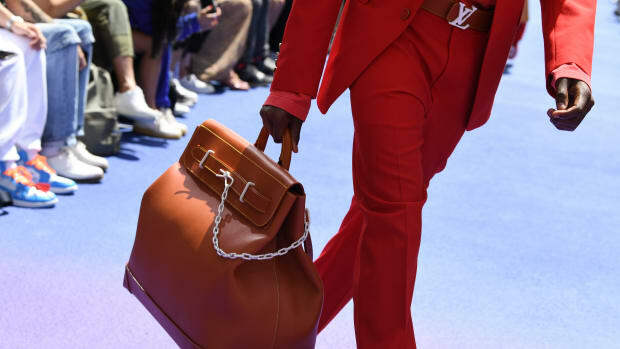 Bags have always been big business for LVMH&apos;s fashion properties, which include Louis Vuitton, Dior, Kenzo and Marc Jacobs, and the luxury group is citing Vuitton&apos;s leather Capucines and W bags as standouts this year. If you ask us, that might have something to do with Michelle Williams&apos; stunning Vuitton ads from this year that feature the totes. Céline also performed well for LVMH, which reports that the brand reached a new record in sales this year. One thing that might tip the scales in LVMH&apos;s favor? Marc Jacobs&apos; forthcoming IPO. With Louis Vuitton&apos;s fashion cred secured by the appointment of Nicolas Ghesquière to Jacobs&apos; old post at the helm of the brand, LVMH will likely be headed for a win when Marc Jacobs goes public. As Vogue UK notes, LVMH CEO Bernard Arnault is hoping for a public offering along the lines of Michael Kors&apos; in 2011. It was certainly an eventful year for brands like Louis Vuitton, Dior, Givenchy and Céline. As the fashion world is waiting with bated breath on the next step in the post-Marc Jacobs-era for Louis Vuitton (seriously, when are they going to officially confirm this Nicolas Ghesquière appointment? ), parent company LVMH is facing issues of its own. Here's hoping Nicolas Ghesquière's first collection for Louis Vuitton is success with shoppers when it hits stores in the fall.